Size of this preview: 439 × 599 pixels. Other resolutions: 176 × 240 pixels | 3,482 × 4,750 pixels. 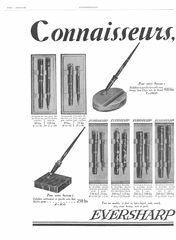 Scansione di una pubblicità Eversharp datata 1929-12-21. Pubblicata su: L'Illustration. Data riportata sul retro del foglio. Pubblicizza i modelli Personal Point, Deco Band, Wahl Engine Turned (lavorazioni Check e Grecian Border) e Tulip Clip ed alcune matite meccaniche. Pagina sinistra. Ritoccata dall'autore per una migliore nitidezza. 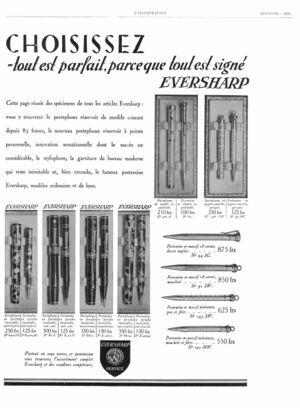 Scanning of advertising from Eversharp dated 1929-12-21. Published on: L'Illustration. Date reported on the back. 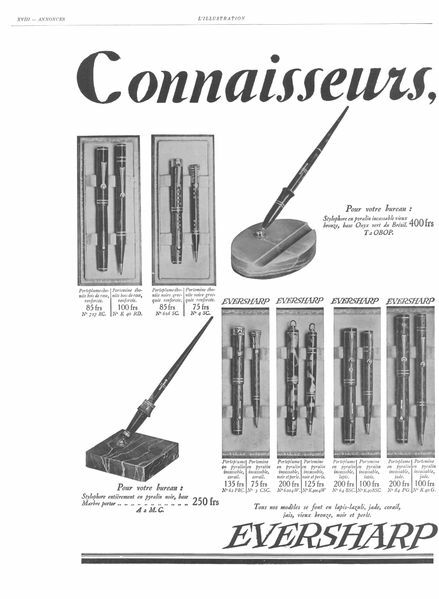 Advertising for the Personal Point, Deco Band, Wahl Engine Turned (Check and Grecian Border patterns) and Tulip Clip models and for some Eversharp pencils. Left page. Retouched by the author for a better sharpness. This page was last edited on 25 May 2017, at 00:47.